Welcome to a place of excitement and adventure, where visitors can feel the rush of the Cometline ride, experience the thrill of the Jet boat, walk the heights of New Zealand’s longest swingbridge, pan for abundant gold treasure, or simply relax and view some of New Zealand’s best native flora and fauna on one of the many nature walks. Buller Gorge Swingbridge Adventure and Heritage Park is a must-see tourism destination, located just hours away from Nelson and Picton, Westport and the West Coast of New Zealand’s South Island, and Christchurch. 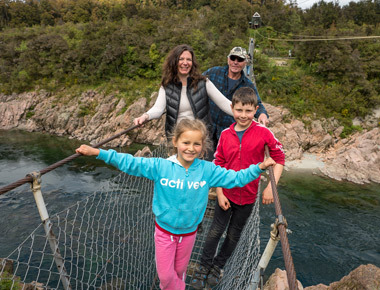 Whether you can spare five minutes or a few hours, they’ll be well spent in the Buller Gorge Swingbridge Adventure and Heritage Park. Cross New Zealand’s longest Swingbridge on the 110m long Buller Gorge Swingbridge, suspended 19 metres high above the mighty Buller River. 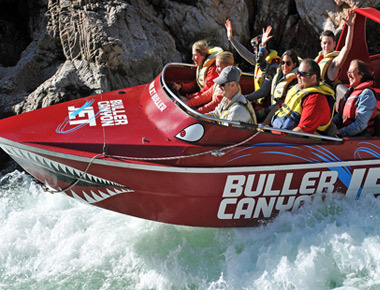 Lonely Planet thinks this may just about be the best jet boat trip in New Zealand. Find out why! Forget the rest do the best. Add to the value with a Comet Line or Supaman Combo. Try a ride high above the river on our high speed Comet Line. 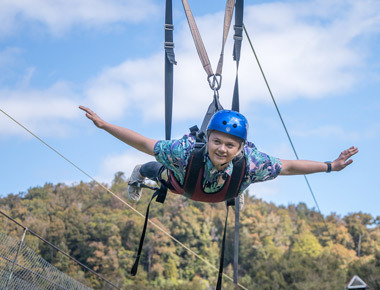 This 160m flying fox or zip line ride is suitable for all ‘young at heart’ ages. Comfortably seated and safely strapped in, you’ll love the sensation.